Launching a new product — especially your first — can be incredibly daunting. Even knowing where to turn for help can be hard. So many blog posts are full of free advice on how to successfully launch that I almost didn’t write another one. Having launched five new products in fewer than nine months, I’ve turned product launches into a science. And while they never go perfectly, these ideas have helped me generate over $200,000 in revenue from online products, starting from scratch. In July 2012, my blog had 100 subscribers. Two months later, I made $12,500 in sales in just one day. It turns out that you can start without an audience and still find success. I’ll assume you are starting from scratch, like I did. The first thing you’ll need is a product or, rather, an idea of what your product will be. Waiting until your product is finished before marketing it is a terrible plan. For most products, the marketing should start as — or even before — the product is being developed. Defining the product, with a tentative title, enables you to start identifying your target audience and putting together a marketing plan, which we’ll cover in a minute. For a year, I wrote a meandering blog about nothing in particular. There were a few posts about design, some more on productivity, and the rest were random thoughts that didn’t fit any category. That year of posting was basically wasted because I came out of it with only 100 regular readers. I was just a designer writing about random topics. 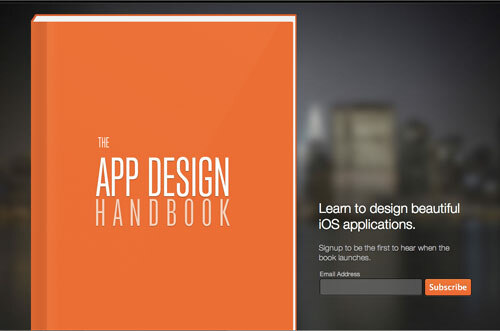 Then, in July 2012, I announced my first book, The App Design Handbook, and something changed. Just by announcing the book with a landing page, I suddenly had a purpose to my writing — to teach iOS app design. More importantly, everyone else’s perception of me changed as well. I wasn’t just another designer writing about anything that came to mind; I was an expert in designing iOS apps, writing a book to teach others to do the same. My skill level hadn’t changed; I’d been a pretty good designer all along. But just announcing that I was writing a book completely changed the perception of my skill level and expertise. Take Inventory: What Do You Have? It was a strange habit, but also very helpful at times. You need to take inventory of everyone and everything that could help you with this product launch: friends with popular blogs, an existing following in social media, and forums or communities you are a part of. I may have felt like I was starting from nothing, but when I really took inventory, I saw that I had a few things going for me: 100 blog readers, 400 to 500 Twitter followers and a few influential acquaintances. When I learned about marketing in college, there was always one question I never got a good answer to: How do you get potential customers to pay attention to you? I knew about buying ads, building brand loyalty and running focus groups, but what if you didn’t have the time or budget for any of that? Back in 2006 I was spending all of my time getting better at Web design — particularly CSS. I was pretty good at coding cross-browser layouts, and I considered myself an intermediate Web designer. I was a bit arrogant. But Chris kept putting out CSS tutorials, and I kept patting myself on the back for already knowing the skills he was teaching. But then, as my friends started asking me questions about CSS, I found myself linking to Chris’ articles, not just because they saved me the effort of having to explain myself, but also because they were really well written. Fast forward another year or two, and I was consulting his articles myself, sometimes just for reference, but other times to learn new skills. While we started at the same level, Chris had improved much more quickly than I did. The difference was that he was teaching. None of that shocked me. The real surprise didn’t come until July 2012, when Chris decided to redesign CSS-Tricks. In order to take some time off to work on the redesign, Chris launched a Kickstarter project, in which his fans could donate to the project and, in return, get exclusive access to a series of tutorials that he planned to record throughout the redesign process. His goal was to raise $3,500. 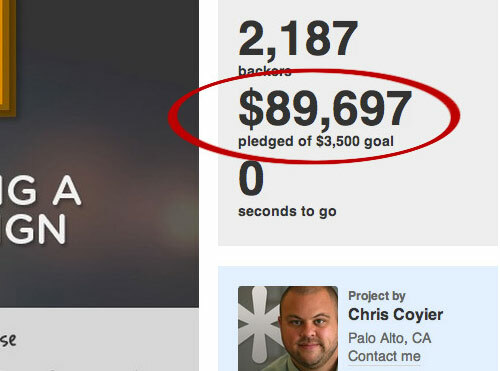 When the project closed, he had raised $89,697. How Were Chris and I Different? Chris and I started at the same skill level. Sure, he got a bit better at CSS over time, but what was it that gave him the ability to flip a switch and raise $89,697, when I couldn’t? Clearly it had nothing to do with skill in CSS. It had everything to do with the fact that he taught everything he knew, and I kept my knowledge to myself. Through teaching, Chris built an audience that benefited from his work and that was eager to pay him the moment he gave them an opportunity. Teaching is how you get people to pay attention to you and your product without spending money on advertising. By giving away useful information, you will attract potential customers — and get them to trust you — because you’ve helped them so much. Then, when it comes time to ask for a purchase, you will have become a trusted advisor, not a random company selling something on the Internet. It’s now time to announce your product to the world. If you have a rough idea of the product and a working name, then you have everything you need. The second biggest mistake I see with product announcements is that the creator has waited too long to start generating interest. In order to announce your product, you’ll need a landing page. You can make this with LaunchRock, a WordPress plugin, some simple HTML code, or ConvertKit (my own product). Either purchase a new domain name (yourproductname.com) or use a subdirectory, like I do for my books (nathanbarry.com/authority). Either works. Just decide and move on. The page should lead off with a headline, preferably something that speaks to the pain you are trying to solve (CopyHackers has a guide on this). Beyond this, I like to include a paragraph or two that goes into detail, and then a screenshot or graphic that quickly gives the viewer an idea of the product. For books, I have a 3-D mockup of the book cover, a screenshot inside an iPhone (to represent an iOS app), and a screenshot inside a browser (for a Web application). I mentioned earlier that launching late is the second biggest mistake I see on landing pages. What’s the first biggest mistake? Not using email. It’s common to see landing pages that don’t offer a way to follow along with the progress. Sometimes the best option a visitor has is to follow the product on Twitter or Facebook. Compared to email, Twitter and Facebook perform very poorly. Getting open rates over 50% on email is quite possible, whereas engagement on Facebook is often well below 15%. Most people deal with every message in their inbox, but they’ll miss your message on Twitter if they don’t sign in at the right time. Plenty of tools will help you capture email addresses. AWeber, MailChimp and Constant Contact all work just fine, but I created ConvertKit for exactly this process. Once your page is live, you can start promoting it. Start by sharing in social media and in any relevant communities you are a part of. Ask friends to share, introduce yourself to authors of relevant blogs, and ask for a link in relevant email newsletters. A well-done landing page will get shared on its own if the product is engaging, but landing pages typically aren’t educational. To get people in your industry to really advertise your upcoming product, you need to teach. Blog posts are a great way to do that. But don’t write posts like “Five Ways to Do X” or “13 Reasons You Should Care About Y.” Those fluffy list posts don’t convey expertise. Instead, write a few definitive, in-depth posts on your topic. Each should stand by itself by including all necessary information. Could each article be a chapter in a book? If not, rewrite it until it is of that quality. That’s the kind of content that will be shared and that will build an audience. This is the time for quality over quantity if you want your industry to really take notice. In each post, make sure to link to and talk about your upcoming product. I like to do this briefly at both the beginning and end of the post, and in between wherever it makes sense. Just remember that you are teaching, not selling. Then, at the bottom of every post, include an email opt-in form so that readers can hear more about your upcoming product. This will put the subscriber on the same email list as your landing page form. I think three posts is the minimum to establish expertise and to maintain a good relationship with your subscribers. Many more and you probably aren’t putting enough effort into each one. Fewer than three and you won’t have enough content to build an email list. Keep in mind that the goal is to get people who are interested in your product to sign up for the email list. Don’t worry about selling up front. Always start by teaching. A visitor will come across your landing page soon after it is published, sign up and then move on with their life. When you email them in three months to say that your product is ready, do you think they’ll remember who you are? Not only that, but they’ll wonder how you got their email address and will be tempted to hit the “Mark as spam” button. You don’t want to find yourself in that situation. Email lists don’t last forever. Any subscribers who haven’t been contacted in the last month start to go cold. After three to six months, your list is nearly dead. Of all the assets in my business, my email list of 7,000+ engaged users is the most valuable. Letting anything bad happen to it would be foolish. Just never let the list go cold in the first place. The easiest strategy is to provide valuable information on a regular basis. Luckily for you, those blog posts you’ve been writing are great content. Let’s say you are able to get 50 subscribers just from your landing page being shared around the Web. (Don’t forget to ask your friends to share!) Send your first blog post to that list. Because they are interested in your product, they will be interested in your post as well. In that email, include a quick update on your progress with the product. Also, ask your subscribers to share this latest post. That new post should get you more subscribers because you will have an opt-in form at the bottom. Now it’s time to write a second post. Let’s say you now have 100 subscribers, 50 from the landing page and another 50 from the new blog post. Send out the second blog post to all 100 subscribers, along with two things: a quick update on the product and a request to share the post with their friends and network. Can you guess what’s next? Yep, repeat the process again. Write another detailed blog post, send it out to your now longer email list, update them on your progress, and ask them to share the post. Sharing on social media isn’t the only way to draw attention to a product. Your landing page and each blog post can be shared on Hacker News, Reddit, Inbound.org, Designer News and StumbleUpon and in email newsletters (especially the ones that just aggregate links). These sources can all drive a lot of traffic. Hitting the home page on Hacker News alone, which is not too hard with good, relevant content, can bring over 10,000 visits. These visits could turn into hundreds of email subscribers. Make sure to share each post and your landing page individually with every relevant source. Did you know you could do everything right up until this point and still have a failed launch? I once launched a new workshop to a list of 5,000 designers and didn’t sell a single seat, all because I sprang it on them suddenly. There wasn’t any build-up or sequence to build desire or demand. Remember how we sent blog posts to the email list as they were published, each with an update on the product? That’s part of the launch sequence, and it is insanely important. But that’s only part of it. You also need to communicate all of the dates and product details well in advance. He’d actually had a great launch sequence up until that point — a large email list and regular updates — but he had failed to mention the exact launch date. The next day his subscribers were going to get an email that they weren’t expecting, an email that asked them to hand over their hard-earned cash. I always send a pitch email the day before a big launch. I want potential customers to have all the information they need to make a decision the day before they have an opportunity to buy. Then, on launch day, I send a simple announcement email. Most of those who received the launch email decided the day before whether to buy. Then, it is just a matter of getting out their credit cards to complete the purchase. Whenever I receive an unexpected sales pitch, I try to decide right then whether I am interested. Even if I am interested, I may put off the purchase for a bit (maybe my credit card isn’t handy right then) or do some more research. Soon, I’ll have forgotten, moved on with work and never come back to buy. That’s why sending all of the details, including the exact launch time, the day before is so important. Do that well and people will be actively refreshing your page to be the first to make a purchase! So, that’s what my friend did to complete his launch sequence. Right after we finished speaking, he wrote an email to his list saying that the product would be available the following morning at a specific time. It would have been better had his readers been able to look forward to a launch date for a few weeks, but I’m sure announcing the day before had a big impact on sales. We’ve been talking about product launches for about 3,000 words now, but we’re just now getting to the actual launch. Does that tell you anything? I hope you’ve learned that the most important aspects of a launch happen long before launch day. Once the scheduled launch time rolls around, hit “Publish” on your sales page. Ideally, this will just replace the landing page that has been up for the last few months. Then, send the announcement email. It doesn’t need to be anything fancy. Aim for clarity above all else: “The product is live — get it here.” Include a short testimonial or two if you feel inclined. The goal is to get your audience from the email to the sales page. If the whole launch process has been done properly, you should get at least a few sales immediately. All three of my books had over $1,000 in sales within the first 10 minutes of the announcement email going out. Now, spend some time looking beyond your email list. Contact every person who has helped you with the product. Thank them for their help, give them free access to the product, and ask them to share the sales page. Many will. Then, submit your website to any news aggregators or blogs that write about you, and post in any communities that you’ve been a part of. Tweet, post to Facebook, and ask all of your friends to do the same. Did anyone ask about your product in the last few months? (I hope so!) Email them to let them know it is now ready and waiting for their credit card number. Then, take a break from the computer. You’ll need it. This last email is optional, but it tends to print money, so you may want to incorporate it. I like to run a 20%-off launch day sale, first, to reward my early buyers for trusting me and being so eager, and secondly, to have a reason to send a reminder email at the end of the day saying that the sale is ending. A lot of people had intended to buy upon receiving the first email but, for whatever reason, didn’t. Looking at the sales hour by hour, can you tell when the second email was sent? My second spike is pretty obvious. Sending that email made me at least an extra $4,000. Your sales will die down. Nothing will be as big as a proper launch, but just know that you went out with a bang and hopefully made some money in the process. Figure out what you can teach potential customers. Announce your product, with a landing page, as early as possible. Ask visitors to subscribe to an email list to stay up to date. Share the landing page everywhere possible online. Write an excellent blog post, and ask people to subscribe to hear about your product. Send this blog post to your email list, along with a product update. Share the post everywhere and with anyone who would find it relevant. Repeat steps 5 to 7 with two more blog posts, each time sending the latest post to the larger email list. Announce the launch date and other details as early as possible. Send an email the day before telling all subscribers to expect the launch the next day and telling them everything they need to know to make their decision. Send a simple announcement email. Work like crazy to promote your newly launched product. Send a follow-up email near the end of launch day telling your subscribers that the sale is ending and that they should purchase right away. That’s it! You can do plenty more for an even more successful launch, such as write guest posts or form partnerships, but if you cover the basics outlined above, you are most of the way there. I don’t want your launch education to end here, so I’ve put together a free three-week course called “Mastering Product Launches.” There will be some overlap between that content and this post, but the email course will walk you through each aspect of launching a product.